A delayed write-up of yesterday's racing. We arrived at the paddock around 9am, with my mate Dave Brown, who had very generously offered to pit for us for the day. Once again, bright sunshine bathed the Isle of Man. When I'm lucky with the weather, I'm really lucky with the weather. Bike preparation consisted of putting in 5 litres of fuel and checking the tyre pressures. We sailed through scrutineering, sat the bikes on their stands in Parc Ferme, and waited for our race, the Junior Support race, scheduled for 11am, to be called. This was a cue for me to get my usual attack of race day nerves, so there was lots of displacement activity, visits to the loos, and consumption of water and energy gels. The call came for our race, and we rode out of the paddock and to the dummy grid in the holding area. After a minute there, we were out of the gate and off on our sighting lap to the grid. As usual, once on the bike, any nerves were gone, and we were on the grid, the board said 'select gear', then 'watch lights', the lights came on, went off, and so were we. Keith had warned me that the mass charge down into Ballakeighan corner on the first lap was one of the scariest things you can do. Actually, I really enjoyed it! so much that I made up a few places, including Keith (who had started on the row in front of me). Everyone sorted themselves out through Ballakeighan, and then we were all on the fast run towards Iron Gates. I managed to make up a couple of place here too! (It helps to have a quick bike). The rest of the race was that strange combination of high speed blur and slow motion; I struggle to recall the details now, but at the time was aware of every input and reference point. On around the third lap Kris Hbberd came past me, on a 15 year old "steelie" (a steel framed Honda CBR600). I thought anyone going that fast on something that old deserved to be let go, but I found I was able to hang on to him, making back down the straights what I was losing round the corners. Together we wound in another bike ahead of us, and while Kris looked for a way past him (on his slow bike), I was able to close right up on both of them. Eventually, on the brakes approaching Cross Four-ways, Kris went one side and I went the other. Poor bloke. Kris got his head down again, and I spent a couple of laps trying to get past him, but the only place I was close was the flat out run down to Stadium, and I wasn't nearly brave enough to attempt a pass there. With 2 laps to go Kris had got himself a small but safe gap, and turning into Castletown corner to start the last lap I saw a spectator urging someone to greater efforts. It wasn't me, so I knew there was someone on my tail. I gave it everything on the way out, tucked in as best I could down the bypass, and pushed my braking point a bit for Ballakeighan. Oops. For a while I though I might completely overshoot, but I just managed to get the bike stopped and made the corner, though missing the apex by yards. I expected my pursuer to drive under me giving a cheery wave, but I guess I must have sucked him into make the same mistake, because when I glanced to the inside he was on the same line as me. So, I gave myself a stern talking to, and hit my marks around the rest of the circuit, and wasn't challenged again. As I crossed the under the waving chequered flag, I was whooping and shouting in my helmet. On returning to the paddock there was a text from my mate Preston saying "Well done" - he'd already seen the result on the internet, while I still had no idea of my position. A quick call confirmed that I'd finished in 14th, with a best lap of 2:45 - some six seconds faster than practice. In fact, my opening lap from a standing start was 2 seconds faster than practice. Keith had been catching me, but had run out of laps to make up for his poor start, and finished in 16th, but with a best lap of 2:44. To say we were both pleased was an understatement - finishing positions were neither here nor there, we'd both had brilliant fun! We then had quite a lengthy wait, as our next race was the last of the day, scheduled for 4:30 [in fact, the Southern 100 Racing club is so efficient, and there were so few incidents, that it actually ran 30 minutes early). This race was the 'Senior support race', allowing 1000s in with the 600s, and so was likely to be a tougher nut. But again I got a good start, perhaps even better than the morning, and weaved my way through the traffic queuing up for Ballakeighan, and then got a couple more on the brakes into Iron Gates. But after that, the guys in front were definitely faster, including Kris Hibberd, and as they rode away from me it was a matter of me hitting my marks and trying not to give away time to those behind me. Unfortunately, I didn't quite manage this, and lost four (four!) places on the last lap to guys lapping faster than me, who'd I'd pinched places off at the start of the race. And the last one of these was Keith. We both knew I would try and attack back, and I planned to come alongside on the run out of Stadium to Castletown Corner, and do him on the last corner. But when we got there, there was another rider with his arm in the air, having blown his engine. This slowed Keith, and allowed me to dive inside to Castletown corner, but I was fast in and very slow out, while Keith didn't panic, used the right line, and drove back past me to the line. So he got 22nd and I got 23rd. Our times were a couple of seconds slower than the morning too. If only the race had been a lap shorter, I'd have been 20th. Woooo hooooo !!!!!! Yabba dabba dooo!!!!!!! Yeeeee haaawwwe!!!!! More considered write up to follow. The grid's out, and I'm not last! 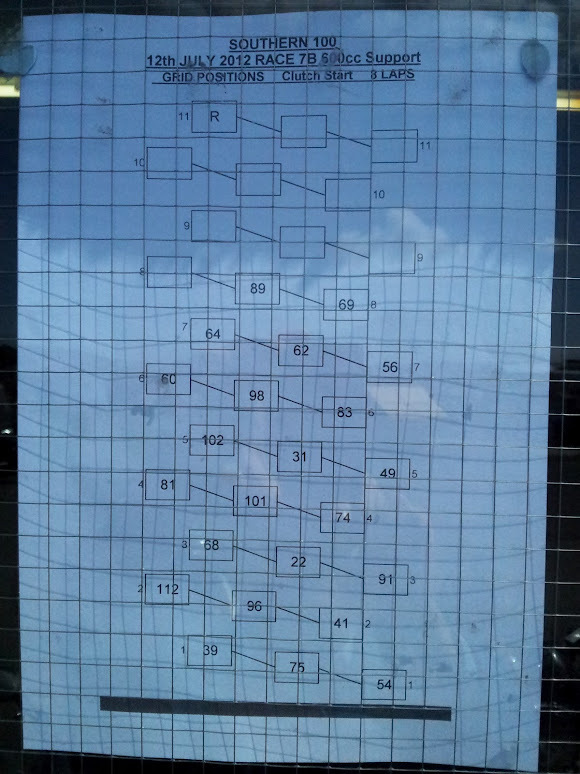 Picture taken through the window (the club's photocopier is broken...) - I'm #62. And my mate Keith is #60, so we might manage a bit of a race, if I can find a few seconds. The weather gods continued to shine on me, and the rain in the morning cleared up to give sunshine and dry roads in the evening. We got to the paddock about 4:30pm, and bike prep consisted of putting some fuel in and checking the tyre pressures. After that it was a leisurely stroll through scrutineering and the long wait in parc ferme. Like last night there was a 'speed controlled' outing (2 laps) for newcomers behind a travelling marshall. Having done it last night, I assumed I didn't need to do it again, but 5 mins before the off an official told me I did (and, actually, it turned out that I didn't. But the extra laps were useful). So, I threw my leathers on in double quick time, and joined the very back of the field. Behind all the sidecars (yes, the solos and chairs do the newcomers laps together). Actually, it was quite fun overtaking sidecars, and I think mixed racing has a future. For the proper practice we decided to get a bit serious (like 90% of the other bikes in Parc Ferme) and put tyre warmers on our bikes. I'd forgotten what a positive mental effect they have, taking away that 'are the tyres warm yet?' thought from the back of the mind as you go round the first lap. Practice went well, and I started really enjoying myself. I found 4 seconds over last night, which means I'm now properly within the qualifying time, tho still right at the back of the grid. I'm not too bothered tho - I'm here for a finish and the experience, and the Billown circuit is not one you throw yourself at (figuratively or literally). Next outing will be Thursday morning, Race 7B (Junior support race) at 11:00am, then Race 12 (Senior support race) at 4:30pm. And then to the pub. Was at work at 7:30am this morning (working out of my company's Manx office - convenient, eh? ), did a (mostly) full days work, left, ahem, a little early, got scrut'd at 5pm, did a 'speed controlled' couple of laps behind a Travelling Marshall, then two more practice sessions, the last one finishing at 9:40pm, put the gear away, got the lap timesheets, ,drove home, having a quiet beer waiting for the pasta to cook. It's 11pm. But enough of my timetable, you want to know about my practice sessions, don't you? (If you don't, why are you reading this blog?). Hmm. Well, it's not like the TT course. The main difference is that you're out with a lot of other bikes, and, given the comparatively short lap (4.25 miles), the properly fast guys are going to come past you at some point. And it's bumpy. And the fast scary bits are FAST! And SCARY! For the first proper practice, I discovered I was seriously under-geared, having to roll off halfway down the main straight. I went up a whole tooth on the front, but the second session was nearly lost because the whole practice session was running quite late (due to an accident, and then an oil spill), so we only got 3 laps. Enough to show that the gearing was pretty close, although it could probably go taller still. Good news is that my time is about on the qualifying cut off, so I'll definitely get in. Bad news is that my time is about on the qualifying cut off, which is pretty slow. But I've been riding within myself, still learning the circuit, so I hope to go a bit quicker. A bit. I need some food. And then some sleep.